We have already talked about our collaboration with company “Akvarel” – granted then it was just beginning. Now, however, a few months later, pleased with the good outcomes, we decided to show present them too. The first thing we did was to change its domain from http://akvarel-bg.com/ to https://akvarel.bg/. 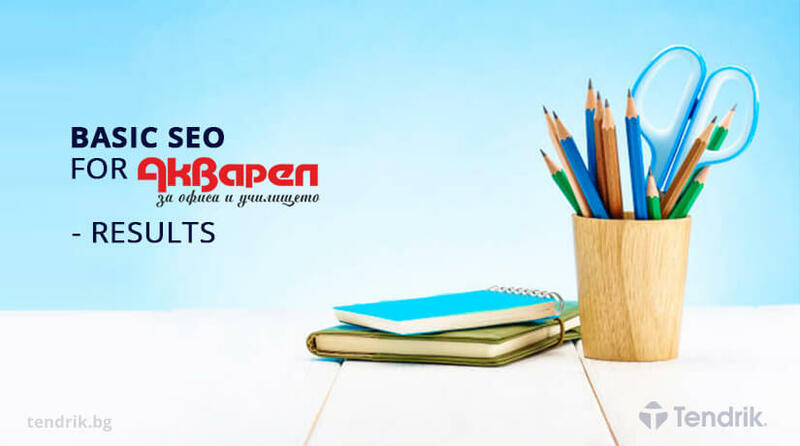 Our experience shows that .bg domains are not only ranked higher on Google.bg than all others but the users more easily remember and write them. After that, the website’s performance in search engines like Google was already improved. We have installed an SSL certificate – Google prefers safer websites and places them first in search engine results. We have done the optimization of part of the content (including images) on the website, including analyzing keywords and semantic core formation, and optimizing existing and writing new headlines and meta descriptions. We have set up Google Analytics for ecommerce tracking – to account the sales on the website and where they come from. We restricted spam traffic to the website. We’ve created filters in Google Analytics to restrict malicious traffic to the website. We’ve added HTML microdata via the Google Semantic Search schema.org library. We have installed and configured Quick Checkout (one-page order). We have monitored and analyzed all the links leading to the website. We have produced monthly reports and a linkbuilding campaign in which we provide a certain number of links per month to the website from authoritative media and directories. As a result, organic search traffic on Google (according to Google Analytics data) has increased three times compared to the month in which we started to work with “Akvarel”. According to Serpstat, the keywords the website was indexed by were 121 (words and phrases), of which 27 were on the first page of Google. Currently there are 3,204 words and phrases, of which more than 100 are on the first page. These are just some of the results we achieved for our several-month collaboration with “Akvarel”. Of course, they include work on our part, and on behalf of the company “Akvarel”. This article, however, is not a fancy way to get praise with the outcome, but just a way to show you that with the right efforts and with a little patience, SEO achieves really good and lasting results.